The national delegates congress of the Great Consolidated Popular Party, GCPP, has ended in the Ashanti Regional capital, Kumasi with the acclamation of Dr. Henry Herbert Lartey as the Standard bearer, Leader and National Chairman of the party for the next four years. Dr. Lartey stood unopposed by the close of the party’s nomination and was therefore declared formally elected by the Director of Elections of the Electoral Commission, Samuel Tettey who led a team of officials from the EC to supervise the congress.Dr. 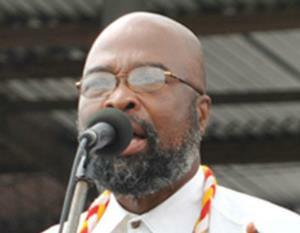 Lartey will chair a 22-member National Executive Committee who were all elected by popular acclamation. The first National Vice Chairmanship went to his 2012 running mate, John Amekah with Madam Adelina Denis taking up the second Vice Chairmanship post. By the party’s constitution, the first National Chairman, John Amekah automatically becomes the vice presidential candidate for the 2016 Presidential election. The General Secretary position was retained by Frederick Ato Dadzie with Quarshie Fliescher Lartey assuming the post of National Treasurer. George Amoah is the National Organizer, Sandra Boateng, the National Women Organizer, Rossevel Annea Kofi, National Education Secretary while Jude Bamba is the National Youth Organizer. Each of the Executives has two deputies. In a victory speech, the Leader and Presidential candidate of the GCPP, Dr. Henry Herbert Lartey said his party is very optimistic of winning next year’s national elections. The government of GCPP will then adopt a bottom-up approach in its national socio-economic development agenda. This will be revolved around energy generation depended on solar in view of the abundance of sunshine in Ghana. Another area that will be key in the development agenda of his government will be industrialization that will emphasize on manufacturing, agricultural production. Dr. Lartey urged Ghanaians to believe their ability to transform the national development. He asked the rank and file of the GCPP to take active part in the campaign by reaching out to everybody in order to get more votes for the party to guarantee victory in the national elections. The General Secretary, Frederick Ato Dadzie was emphatic that GCPP will cause a major stir in next year’s Presidential election. He thanked all the delegates of the party for the trust and confidence reposed in the new executives to lead them for another four years. Only the United Front Party, UFP, was represented at the congress to show solidarity. It was represented by its national Chairman, Nana Agyenim Boateng. Certificate of recognition was presented to all the party members who have in diverse ways contributed to the progress of the GCPP since its inception.